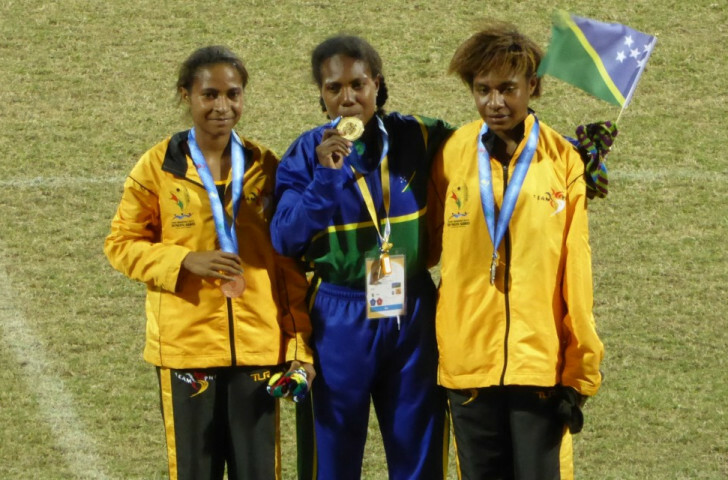 Sharon Firisua of the Solomon Islands produced a dominant display to take gold in the women’s 5,000 metres, setting a Pacific Games record, on the opening day of athletics here today, before claiming the pace of the race was “very slow for me”. Firisua, lapped twice in the 5,000m race at the Commonwealth Games in Glasgow last year in a race won by Kenya's Mercy Cherono, clocked 18mins 20.09sec to claim the title ahead of Papua New Guinea's Rama Kumilgo and Ongan Awa. Kumilgo was more than three seconds adrift of the winning time, which was a Solomon Islands national record, while team-mate Awa was a further second behind. Firisua led from start to finish, kicking early on to leave the rest of her opponents in her wake before completing a victory that gave her country its fourth gold medal at Port Moresby 2015. “I’m really glad [to have set a new Games record]," she said. Another athlete in record-breaking form was Pascale Gacon of New Caledonia, winner of the pole vault with 3.70 metres. Gacon’s personal best stood at 2.95m before she took to the track in front of a packed-out crowd and delivered a gold medal-winning performance, although her result was some way outside the top 150 vaults recorded by the International Association of Athletics Federations in 2015. Team-mate Keona Legoff claimed silver with a highest jump of 2.80m, narrowly in front of Tahiti’s Teumere Tepea, the bronze medallist. Defending men’s javelin champion Leslie Copeland was rarely troubled on his way to retaining his title, although his best effort of 70.31m was 10 metres behind his personal best. The Fijian's effort proved enough to beat Vahaafenua Tipotio, who secured Wallis and Futuna’s first silver medal at Port Moresby 2015 with 65.41m, while Erwan Cassier of New Caledonia sealed bronze. Copeland revealed afterwards that he had been hampered by an injury, although he remained satisfied with his display. “I’m happy with that,” he said. “I had a rotator cuff injury in my right shoulder, and I only trained for three weeks prior to this. Sapolai Yao of Papua New Guinea got the crowd pumped up right from the off as he cruised to a commanding win in the men’s 3,000m steeplechase, taking gold ahead inf 9:38.89, nearly nine seconds quicker than his nearest challenger, team-mate Skene Kiage. Ashneel Abhinay Nand was able to add to Fiji's medal tally with bronze in a race that ended in farcical fashion as athletes struggled to stay on their feet after jumping the last barrier. The last gold of the night was won by Fiji’s Miliki Tuivanuavou, who sealed the women’s shot put crown with a best of 14.59m. 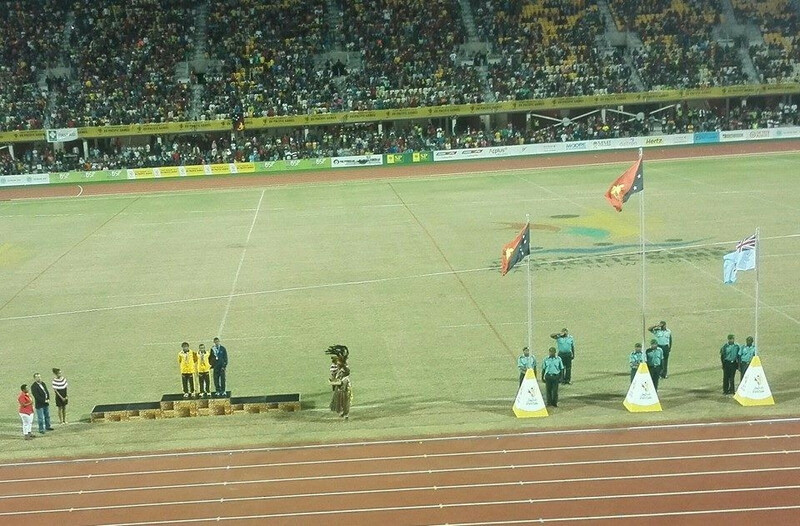 Cook Islands’ Tereapii Tapoki’s 14.31m allowed her to clinch silver, while Tonga’s Ata Tuutafaiva earned her country's seventh medal of these Games with with a bronze.